This view has already changed, and will soon change even more dramatically. In the 1931 Vancouver Public Library image, the newly completed Royal Bank Building towers over the turn of the century single storey retail, located across the street from the Canadian Pacific station. The bank had acquired the site in 1912, paying $725,000 for the site for their new headquarters. It took them until 1929 to demolish the Hadden Building, (built in 1899) and replace it with their art deco skyscraper – or more accurately, half a skyscraper. It was designed by S G Davenport, a Montreal based architect who was the Royal Bank’s staff architect. Although designed to be built as a wedding cake tower, Vancouver still has only just over half a cake as the eastern second phase was never built. There’s a proposal to add a contemporary tower to the east to define the shape, but not the design, of the original tower. This would also allow seismic improvements to the 1920s building. We looked at the stores in the foreground in two earlier posts, one in 2012, and one a year later. They were built in 1911 and designed for the Allan Brothers (who also built them) by W P White, a Seattle architect who designed a number of Vancouver commissions in the early 1910s. 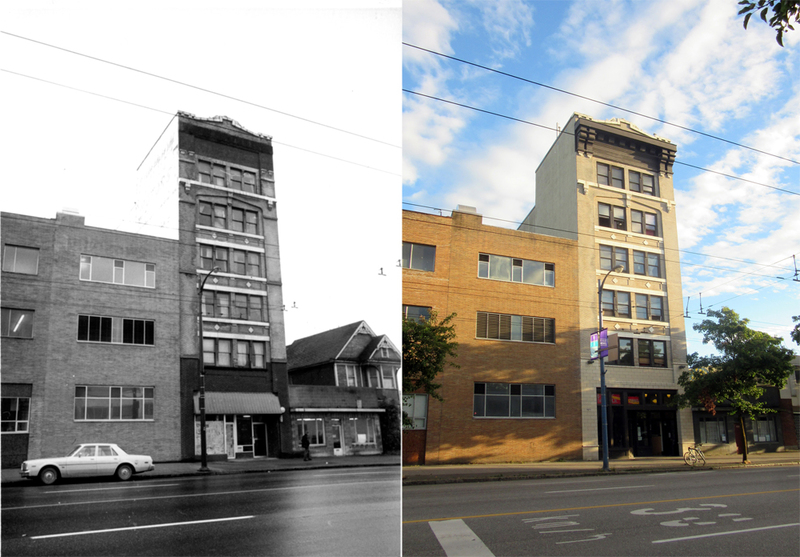 In 1969 they were replaced by a parkade, seen here a little while ago, and now that structure has been demolished to allow construction of a new office tower that has partly been sold as strata office space. The Del Mar Inn started life as the Cadillac Hotel. Built in 1912 for A E Hansen, according to the permit, it was designed by W P White and built at a cost of $33,000 by Frantz Construction. We haven’t successfully identified the developer’s identity; The only potential developer with a name that matched the permit living in the city at the time was Alfred E Hanson, who was listed as a contractor, and it seemed unlikely that he could fund a $33,000 development. (There was an A E Hansen in Seattle, and as the architect also came from that city, it was possible he was an absentee investor). The Daily Building Record said Mr. Hanson lived at 1236 East 12th Avenue; Albert E Hanson lived on East 12th, but at 1033. The address of 1236 wasn’t recorded in the street directory. Adding to the confusion, the 1911 census recorded Mr. Hanson as Albert A Hanson, aged 50, retired and born in the USA. He was shown as arriving in Canada in 1909, although that seems inaccurate as his three children living at home, aged 19, 18 and 14, were all born in BC. His wife, Mary was from Ontario. The 1901 census said Albert Hanson was in Vancouver in 1901 as a hotel keeper, with wife Mary and five children at home. He was American, aged 44, and had arrived in Canada in the 1880s. Albert Hansen was shown in the 1901 street directory running a boarding house at 852 Powell Street. In 1891 they were living in Yale, with the CPR employees, where he was aged 34 and described as a retired foreman, presumably of a railway construction crew. Mary was shown born in Quebec in that census. In 1913, when the hotel opened, it was run by William Jureit. He had been lodging on West Hastings in 1911 with his wife and three children, and was a builder who had just arrived in Canada from Germany in that same year. In 1915 Mrs Helen Mulholland had taken over running the building, which was partly a rooming house rather than a hotel, with a bookkeeper and a warehouseman among the tenants, and a real estate company occupying the main floor space. In 1920 there were different proprietors, Mrs E Montgomery and Mrs J Carmichael, who also both lived in the property. By 1925 the name had changed to the Cadillac Rooms, run by Mrs E Fletcher, but by 1930 it had reverted to the Cadillac Hotel run by Mrs Jennie Cook. In 1935 Mrs K Sobotka was in charge, and in 1940 Joseph Fay. By 1945 it had become known as the Coast Hotel, run by S B Farmer, and by 1955 the name was changed again to the Del Mar Hotel, run by Joseph Lasky. In 1990, Mr. Riste collaborated with the artist Kathryn Walter with whom he wrote the slogan: “Unlimited growth increases the divide”. A typographic artwork, with seven inch-tall copper letters, was installed as a frieze on the building’s façade. Art galleries have occupied the main floor for many years, including by the mid-1960s, the Bau-Xi gallery, and today the Or Gallery; our image shows it in 1977. George continued to actively manage the property until 2007, and died three years later just short of his 90th birthday. His family continue to own and manage the property as exemplary privately owned low-income housing. We’re looking along Beach Avenue in the 1960s in an Archives image that was shot by Leslie Sheraton. On the right is the Sylvia Hotel, and on the extreme left is the last remaining building on the water side of the street; Englesea Lodge. Like the Sylvia Hotel, Englesea Lodge was designed by W P White, a Seattle architect. In some ways it had a similar design, with brick cladding although it’s the base rather than the upper story that has a white finish. It was smaller than the Sylvia, two storeys shorter, and cost less to build – the Permit was issued in 1911 and E Cook built it for $115,000. The developer listed on the permit was Annie Davidson, although the Province newspaper said it was built for A A Davidson. The Davidsons arrived in Vancouver from Victoria, where Augustus Alexander Davidson ran the jewelery store that traded as Davidson Brothers. His brother, Cicero Davidson, ran the Vancouver store, and also invested in real estate, building an apartment building and a retail building, both still standing today. It looks as if Augustus (although he seemed to have been known by both of his names at different times) and Annie arrived in the city around the turn of the century. They were first shown in the 1900 Street Directory when A A Davidson was a partner with his brother in the jewelery business, and also had a real estate office. The family briefly lived on Melville Street, but then moved a block away from Cicero on Burrard Street. The 1901 Census shows Alexander aged 38, born in New York and coming to Canada in 1864. That birth date is at odds with his marriage and death certificates, which are more likely to be accurate, which show him born in 1864. He married Annie McKeil Adams, aged 21 who had been born in Victoria in 1893 when he was shown to be born in Lockport, New York. According to the 1901 census his brother Cicero was born in Ontario 1859, but the 1871 and 1881 census records only show Augustus living with a brother called Freman, born in 1862 in the US. Augustus was shown living with his mother, Mary Jane (34) and older brother Freman Davidson in Guelph in 1871, and both boys were shown born in the US. Augustus and Freman were still in Guelph in 1881, but living with John Davidson aged 49 and his wife Elsie, who was aged 39. That makes us think that Cisero may have changed his name (from Freman, or Freeman) when he moved west, abandoning the even more unusual father’s mother’s family name. In 1897 both Augustus and his brother, Cicero were two of the four owners of a $250,000 mining company, Winchester Gold Mines of Fairview, Victoria, formed to purchase the Winchester claim in Yale. The same year they were also partners in the $250,000 Shamrock Mining Co with the intent of taking over the Shamrock claim in Osoyoos. Cicero was also briefly a defendant in a case against the Orphan Boy Gold Mining Company on McCulloch Creek where the owners (including C N Davidson) were accused of defrauding shareholders. Augustus seems to have maintained active involvement in the region’s mining activity, but there’s no mention of Cicero retaining an interest. In 1911 Augustus and his family were living at 2030 Beach Avenue, which is where the lodge was built a year later. The notoriously unreliable 1911 census shows A A Davidson was aged 44, born in 1867 (five years older than the previous census held ten years earlier had suggested). Annie was shown as aged 40, (so she had added eleven years in a decade). While in 1901 they had a son, Randolf aged 7 and another, Douglas aged 4, ten years later there was John, aged 18, Douglas aged 14 and a daughter, Elsie, who was 7. (We assume John and Randolf are the same child, following the family preference for name switching to try to confuse future historians). Augustus died in 1950 aged 85; Annie was 88 when she died in 1960. Eve Lazarus chronicled the end of the Lodge in 1981. The City of Vancouver had acquired all the property along the waterfront, and while the houses had been cleared away and the park extended to the street, the Lodge was too big to treat in quite the same way. It cost the City $375,000 in 1967, and although rents covered the cost of purchase, by 1975 it was decided to demolish it anyway to complete the undeveloped park. Then that decision was reversed and in 1980 29 of the 45 apartments remained occupied, and there was talk from the city of investing $1.3 million to turn the building into senior’s housing. In February 1981 a suspicious fire was set, the fire brigade were said to have been instructed to let it burn, and with the lucky outcome of no injuries or deaths the Park Board had a contiguous park along the foreshore. We saw another angle of this corner in a much earlier post. The single storey stores built by the Allen Brothers and designed by W P White saw a number of different occupants over the years. In this 1926 picture the corner was occupied by Stan’s Express – although it’s not completely clear what Stan (who was Stan Collins) did so speedily. Next door was a cafe called the Burnaby Lunch (run by Mrs Lydia Brazee, who lived a few doors down in the Almer Hotel), and McIver’s Garage was at the back. Pacific Coast Taxis also operated from here (run by S T Cann and C W Cote) – that’s their office underneath the Coca Cola sign. Here’s another 1959 view of the same corner. Lando’s Furs now feature prominently, (and around the corner was also Lando’s Indian Curio store) but you could also pick up cigarettes from Wilson’s News-Stand or stop for a haircut from the Principe Brothers. All this was about to change – the signs on the windows show the tenants were being ‘FORCED OUT’ and warning patrons of Trute’s Dry Cleaners not to forget to collect their laundry. The 1969 structure that replaced the stores is now a little closer to becoming another lost parkade – a proposed replacement office tower has now been redesigned to the approval of the city’s Urban Design Panel and can now proceed to rezoning.